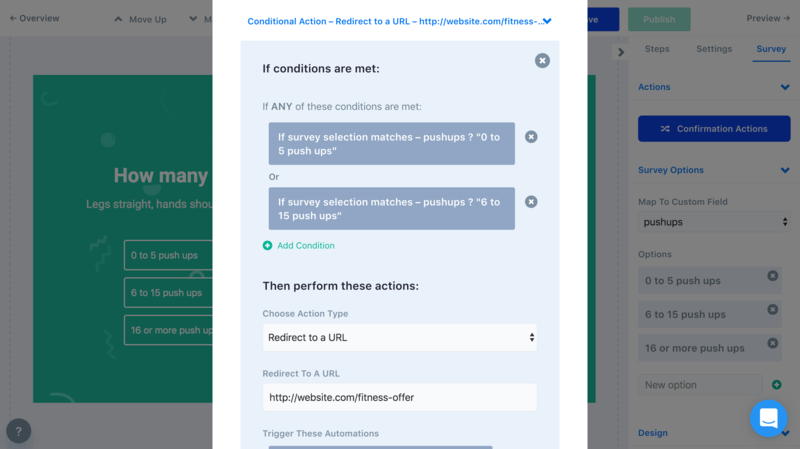 Conditional actions allow you to perform actions for specific visitors, that meet the conditions you've defined, when they complete a form, button or survey element of a CTA. To add a conditional action, go to the "Confirmation Actions" in the builder panel while editing a form, button or survey, and click "+ Add Conditional Action". Once you've added a conditional actions, you'll be able to add conditions that must be met for the actions to be performed. For example, if you were surveying your visitors on how many push ups they can do, if they can only do 0-5, or 6-15 push ups, you could direct them to a product recommendation based on their fitness level. So you would add conditions for if their "push ups" survey selection is either "0 to 5 push ups" or "6 to 15 push ups". 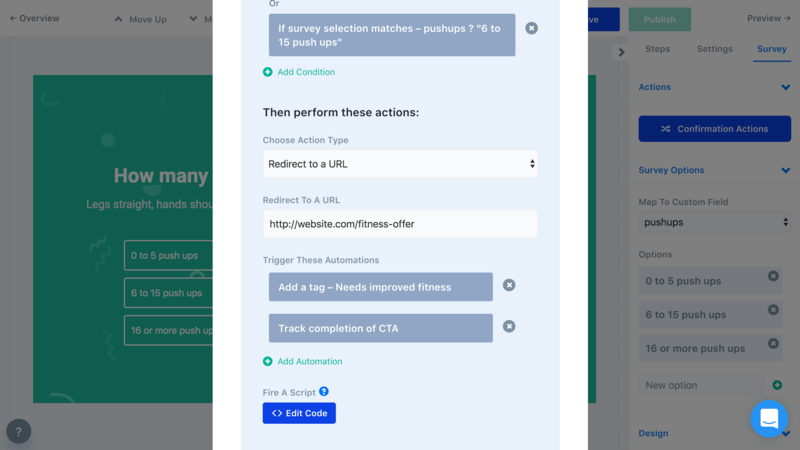 Pro tip: For conditional actions, you can also use the same condition types you use for targeting CTAs to website visitors. This means conditional actions can be performed in very specific scenarios you define, such as if a form is submitted on a specific page, or if the person is already tagged as customer, etc. This helps you personalize the outcomes of your CTA campaigns and landing page funnels for any type of visitor segment you may define. When the conditions of a conditional action have been met, when someone completes the form, button or survey, the action type of that conditional action will be performed instead of the default action. Select the action type you want to perform if the visitor meets the conditions, and you'll be able to enter the details. The default automations added to your form, button or survey will always run for visitors when it's completed. However, if a conditional action is performed because a visitor has met the conditions, the automations added to that conditional action will run as well. This helps you conditionally run automations in your tools, such as applying segmentation tags depending on the options entered into a form or survey.